Has Loussier made a Radiohead compilation yet? No need, here's something just as intelligent, introspective and outdoing. Music composed by Giuseppe Millaci. Recorded in July 2016 at WallStudio Music by Jonas Verrijdt, mixed by Jonas Verrijdt, mastered by Dré Pallemaerts. Nostalgia Op. 1; Imagining The Fourth Dimension; Travel To; Unknown Land; Song For Clarice; Crazy Night, Lazy Day; Room 317; Lollipop; Skylark. 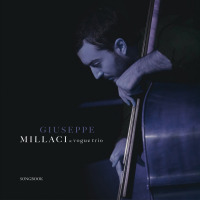 Giuseppe Millaci: doublebass; Amaury Faye: piano; Lionel Beuvens: drums.